Posted on December 6, 2018 at 6:21 pm. 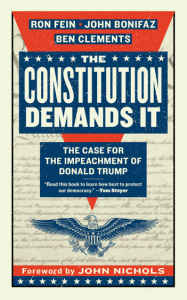 On November 27, US Representative-elect Rashida Tlaib delivered our book, The Constitution Demands It: The Case for the Impeachment of Donald Trump, to every new member of Congress, as reported by the Independent Journal Review. To learn more, read the article in the Independent Journal Review. To purchase our book, click here.